For proper country sorts, the best proposals require a sporting setting and one muddy knee. Whether the way to your beau’s heart is on horseback, the river bank or even a boar hunt – intentions declared in the field are rarely rejected. But the field is not always the place to easily facilitate a romantic moment. So how to go about it? Alexandra Henton speaks with the brave field men who have gone before and taken the bull by the proverbial to ask the question. Dinner a deux on St Valentine’s day is not worth considering. Gathering a jolly crowd is the only way to do it. But if you are the one tasked with chef duties, a spectacular feast is a must. Follow The Field’s Valentine’s Day menu for an impressive supper guaranteed to impress. And if your gift has fallen flat and the card got lost in the post, look no further than a subscription to The Field to restore that special someone’s good humour. It is the guaranteed way to a country sort’s heart. And, unlike red roses on the 14 February, it is immensely kind on the wallet. Prices start at just £20.99. The infamous chubby sprite forces his way into our national consciousness this month. Most sensible types, however, will be among the vanguard organising cracking dinner parties, a spot of pigeon shooting or a bracing February meet. When it comes to love and romance, the field man follows some basic but strong guiding principles. Always be prepared, never alarm the quarry, and never, ever attempt dinner a deux on St Valentine’s day (a sure-fire damp squib). Although we’re not thinking keys in bowl, more a convivial gathering of like minds. When it is time to pop that question everyone knows it’s not what you say but the way you say it, this is what makes the best proposals. The staunchest of birds can become the flightiest with an incautious word or rash deed. And yet who does not recoil from the ring ‘n’ restaurant cycle? Fortunately for the bucolic pioneers, other options are to hand. Fishing and romance are rare bedfellows for the best proposals in the field. There are some exceptions. A secluded picnic blanket by the side of a gurgling chalkstream in summer has allure and there are fishing huts on the Test where nymphing starts in May. But the waders, Polaroids and bottles of Gink are more likely to drive a wedge between a courting pair than facilitate a declaration and one of the best proposals. And though they may conceal it prettily, many’s the decent country girl left shuddering at the prospect of an icy week’s spring salmon fishing. Bearing all this in mind, Charlie Ramsay – founder of www.historicbritain.com – who is an all-round sportsman and Highland hero, set about orchestrating one of the best proposals in the field with military precision. Heading north to engage the salmon, the plan was marshalled. “I decided on a pool on the River Lyon that was rarely fished, so the only risk would be from other fishermen,” he confides. Intent on preserving the element of surprise he tied the ring to the end of a 9lb line. This was hooked on to an overhanging branch and lowered into the pool to dangle until the allotted hour. Casual passers-by would see nothing but a caught line, the common by-product of a careless cast. A dashing flourish was added by anchoring a bottle of champagne to 16lb monofilament and lowering it into the pool within easy gaffing distance. “The following day was spent on the hill but by Saturday afternoon some extravagant croquet shots could have alerted the watchful to a nascent nervousness,” he admits. Fishing was duly suggested and the deserted pool became centre stage for one of the best proposals. “I was standing on the rock casting and said, ‘Look, someone has caught a line.’ With no further hint my girlfriend started to pull the line out of the water. She was obviously expecting a fly or a hook and I think I might have noticed her jaw drop fractionally when she realised what had come out of the water,” he recalls. Up came the champagne, down went the knee and yes was the answer. If this tale of plucky piscatorial passion and one of the best proposals in the field seems somewhat exalted, the nervous suitor can rest assured. On stepping back from the rock, our northern blade missed his footing and fell into the river with the champagne glasses. They are marrying this year. There is a hint of the intrepid when love and stalking are coupled. Hillmen run deep. One such Casanova had a hide specially prepared with a romantic picnic. Another burgeoning suitor, country sports photographer Brian Phipps, chose Gaick, a top sporting lodge, to propose to his sporting artist girlfriend Teresa Davis. Situated deep in the Highlands of Perthshire, it’s one of Scotland’s oldest lodges, built c1820 by the Duke of Gordon. “It has a 12-mile single-track drive and the hills are so steep they’re frightening,” he says. “Landseer and Thorburn are Teresa’s artistic heroes and they had both stayed and painted here. It seemed to be the perfect location for one of the best proposals,” he continues. But weather can nullify even the most diligent plans. “A hilltop proposal, 2,500ft above sea level, suddenly seemed like a hare-brained idea as the weather conditions were appalling,” he says, “So I waited until we were back at the lodge.” After an exhilarating day on the hill, covered in blood from his first stag and peat from the mountain, it was one of the best proposals not to be refused. “Teresa had her first stag at Gaick the year before and we love it so much that she is considering riding to the wedding on a garron at Gaick,” he reveals with delight. A different take on gate-shutting. As you’d imagine, with all that adrenalin, whips and polished boots, the hunting field lives up to its name. Engagements, best proposals (decent and indecent) and assiduous courting create a maelstrom that would bring colour to Jilly Cooper’s cheeks. But it is the more romantic gesture that can stop a Diana in her tracks. One Grafton hunting girl, Tamarisk Woods (now Leeming), was left reeling when her beau popped the question after she and her horse had come down over a trappy hedge. “I was covered in mud and seeing stars,” she says. “He had already disappeared in the morning and left me to get the horses ready [he was asking her father’s permission]. He had a second horse, so I kept telling him to go on,” she continues. “But he gave up on second horses and asked me to marry him.” Even on their wedding day hunting couples are hard to remove from their horses. “The day we got married I went autumn hunting in the morning with about 60 of our guests – a great start to the day,” Tamarisk says. 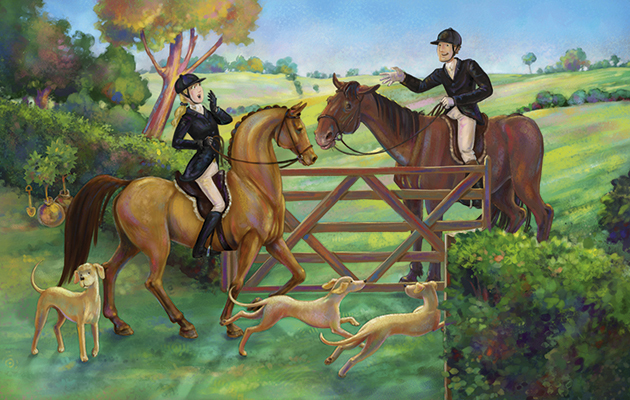 The serious hunter isn’t to be deterred from sport easily, even when planning one of the best proposals. A Leicestershire swain suggested a hunting trip to his childhood haunt in Norfolk as part of a carefully cultivated plan. A day with the North Norfolk Harriers was promptly organised. “On arrival, the hireling lady had run out of horses and my horse lost a shoe. Not a particularly auspicious start,” his wife reveals. “When he finally appeared on the hunting field he was on something that looked like a cart-horse – the most unattractive thing I have ever seen on four legs. We just couldn’t stop laughing, ” she continues. “It refused a small rail and as hounds were screaming I went on and we were separated for about an hour,” she recalls. “When he eventually caught up he volunteered to stay behind and shut the gate – much to my annoyance. I had been having a fantastic day.” Once everyone had passed through the gate our hunting hero asked the question and received an affirmative. “There are now two oak trees planted either side of the gateway and we are both still hunting, but now with our four children,” she says. If not taking part in a traditional fieldsport, then the right-thinking man is still likely to choose a different sporting setting for the best proposals. The ski slopes are particularly popular. The snow brings out the chivalrous nature of the most hardened country types. Over the past few years almost every bunch of friends returning from a ski trip has reported an engagement. A usually robust chap became so nervous about the consequences of the annual Meribel jaunt that he’s refused to sign up this year. Following the future Prince of Wales’s lead, the African safari proposal seems likely to gain in popularity, although the hunting man has often chased romance in exotic surrounds. An adventurous shot proposed on horseback in Mongolia and another has deemed a boar hunt the most likely of places, although he is yet to meet a suitable candidate. Whether a ring attached to the front of the boar’s nose is a practical possibility has yet to be decided for one of the best proposals. Away from the field the hunt ball remains the essential pre-proposal ground. Alongside the Game Fair it is the backbone of many blessed shire unions. Numerous are the country cads who have met their match in the early hours in a Shire marquee; for better or worse. I tripped over Mr Right while visiting the Wynnstay hunt ball. He proposed on a hill overlooking Quorn Friday country (the way to any hunting girl’s heart) and reader, I married him.